Not many people were lucky enough to have experienced the Dreamcast during its heyday. Certainly not enough to stop SEGA’s final machine kicking the proverbial bucket well before its time. Those that did though, were treated to an amazing crescendo of classic games as SEGA bowed out of the hardware market for good. 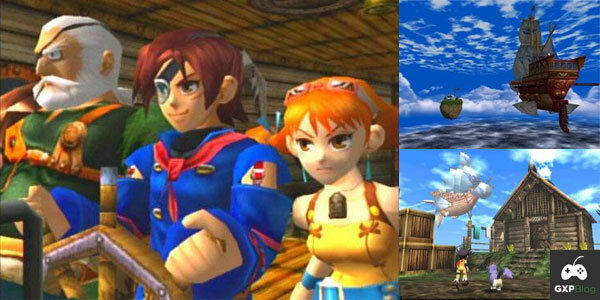 One of those games was Skies of Arcadia and I’d like to share with you why it’s not only one of the greatest games of the Dreamcast’s stellar goodbye line-up, but arguably the finest JRPG to have ever been made. From the epic introduction of Vyse as he swings by rope from the Albatross onto Alfonso’s ship to the climactic battle with Zelos, every element of this epic adventure feels like it was expertly crafted. 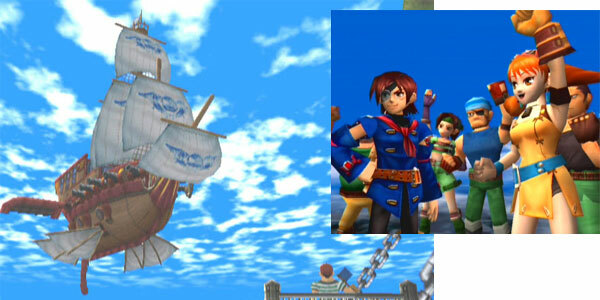 For a start, the entire world of Vyse and his merry band of Blue Rogues was rendered in the game’s 3D engine. This marked a huge departure from the pre-rendered worlds offered up for exploration in Square’s PSX-era epics. The camera was free to sweep around the lush environments and there were no longer any jarring leaps from the in-game world to CGI cinematics. It helped maintain a consistency to the player’s immersion in Skies’ world and story that console gamers in 2001 simply hadn’t experienced before. Unfortunately, new experiences didn’t extend to the plot and it’s perhaps the only area of Skies that it’s fair to accuse of being a little unoriginal. Its tale of a lost princess falling from the sky and proving the key to defeating an evil empire with a plucky band of rogues is as clichéd as it gets. The story is still told with such a great deal of charm though that you’re prepared to forgive it falling back on some well-trodden paths when those same paths regularly lead to truly unforgettable moments. Moments like when you successfully pilot your upgraded ship through a vast vortex that the world’s inhabitants believe to mark the end of the habitable sky, only to find new, undiscovered continents waiting on the other side. The game begged you to explore its massive world and rewarded at every turn, oozing SEGA’s “blue sky” design both literally and figuratively. Vyse’s epic journey would take him from the idyllic village of his home island to harsh industrial cities of the Valuan empire and on to undiscovered lands in the east whose oriental designs delivered a wonderful sense of the alien to both the characters and player alike. All this exploration was further enhanced by one of the greatest scores of the era. I still have the soundtrack on MP3 somewhere actually. 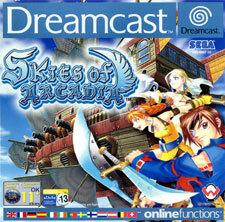 Skies’ aural delights weren’t limited to the wonderful pieces of theme music for each character or area though. SEGA was very proud of creating one of the first dynamic soundtracks which could react to your performance in battle. If victory was close, rousing strings would herald your impending success, while flirting with defeat, on the other hand, would see the score change to more dramatic, stressful tones. Once again it’s another example of just how many ground-breaking features were crammed into this game by SEGA’s talented designers. The Overworks team (formerly AM7) began work on Project Ares, as Skies was originally codenamed, back in 1998. This veritable dream-team had already made names for themselves with previous classics like Phantasy Star and Panzer Dragoon Saga. Even taking into account this pedigree, it’s truly astounding to think that such a deep, polished game could be turned around in only 2 years* and on hardware that was barely a year old no less! Not only did they deliver a game that would be a monumental testament to the power of the Dreamcast, they packed it with ideas that wouldn’t resurface in other games until years later. Take the side-quest that challenged you to discover key landmarks and wonders as you sailed your ship through the skies. I didn’t encounter this as a feature in an RPG again until 2006’s Elder Scoll’s IV: Oblivion. There was even a base-building mechanic that didn’t appear until the final third of the game. Following the destruction of Vyse’s original hideout after the Blue Rogue’s discovery by the Valuan empire, you fled with the survivors to find a new island on which to regroup and strike back. This is an element that was greatly celebrated when it appeared in Assassin’s Creed II (and rightly so, I loved it) but that was almost ten years on from Skies’ release. *The Japanese release was 2000.